UFO SIGHTINGS DAILY: Strong Alien signal traced to sunlike star sets SETI on alarm, Video, UFO Sighting News. Strong Alien signal traced to sunlike star sets SETI on alarm, Video, UFO Sighting News. I have been reluctant to put this up, but I guess I should. However this was discovered over a year ago...and it really make me wonder...why so late to tell the public? It well known that SETI often hides alien signals its discovers, and can only release such information with the US presidential content, so I guess this is part of their alien trickle down theory. Little by little let the public know whats out there. Alien Life Found? 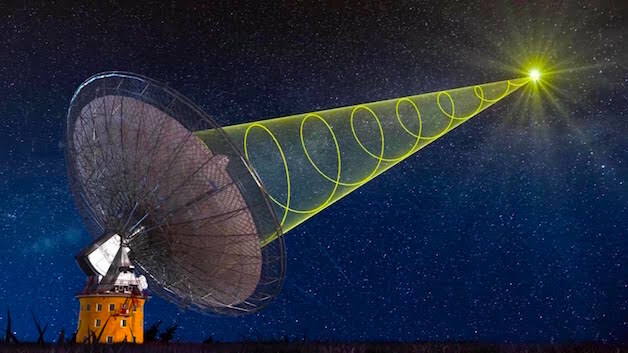 Extraterrestrials 'Strong Signal' From Russian Telescope Is Detected, Scientists Say.SETI researchers are buzzing about a strong spike in radio signals that seemed to come from the direction of a sunlike star in the constellation Hercules, known as HD 164595. The signal conceivably fits the profile for an intentional transmission from an extraterrestrial source – but it could also be a case of earthly radio interference, or a microlensing event in which the star’s gravitational field focused stray signals coming from much farther away. In any case, the blip is interesting enough to merit discussion by those who specialize in the search for extraterrestrial intelligence, or SETI – including Centauri Dreams’ Paul Gilster, who brought the case into the public eye this weekend. At least two SETI research groups are aiming to track HD 164595 tonight. The SETI Institute is using the Allen Telescope Array in northern California, while METI International is looking to the Boquete Optical SETI Observatory in Panama. Gilster reports that the signal spike was detected more than a year ago, on May 15, 2015, by the RATAN-600 radio telescope in Zelenchukskaya. That facility is in the Russian republic of Karachay-Cherkessia, not far from the Georgian border.